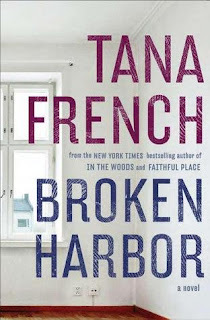 This is the first book of Tana French's I've read. The main character is a secondary character in a previous book. There is reference to a past incident that I assume took place in the previous book, but otherwise Broken Harbor is a stand alone novel. The premise of the story was intriguing. Within the opening pages, you know a mess is going to happen. Here's what I'm trying to tell you: this case should have gone like clockwork. It should have ended up in the textbooks as a shining example of how to get everything right. By every rule in the book, this should have been the dream case. It was the question "what is going throw the wrench in this 'clear' cut case?" that kept me reading to the halfway point. Still it took forever to get to that point. Broken Harbor is a slow read. I was hoping with the murder of a family that it would be a book that I couldn't put down. It is more of a procedural than a suspense novel. I don't think I like procedurals. Though the book was touted as being about a fan favorite character - Mick "Scorcher" Kennedy. I didn't like him. He was just too full of himself. Definitely the walking example of "pride goes before the fall". I liked his trainee partner Richie though. And maybe it was the character foil that made it even more difficult to like Kennedy. By the end of the novel, I didn't care you had committed the murders and the answer to the question in the beginning didn't really matter to me anymore. I finished it mostly because I hate not finishing a book. I had trouble getting into the book because of the Irish slang and terminology. I usually like books that have the "right" language for the setting and I've become somewhat knowledgeable in British English. Or so I think. And it wasn't the actual dialogue that I found difficult to follow. It was the descriptions in the narrative. I could never fully visual the setting because I wasn't definite on what was being described. 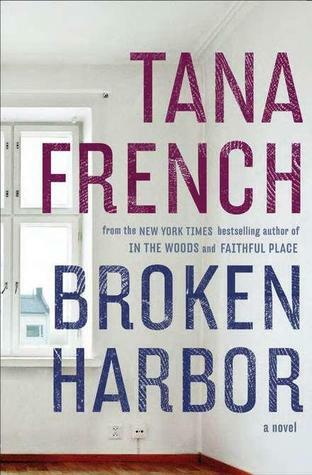 Broken Harbor is a well written story with an interesting plot. For me it was delivery that was a problem, but if you like more the inside details as opposed to the fast pace action, then you will like this book. Page after page about blood splatters is just not my thing.